Snail Porridge: a painting by Sean, an inmate of HM Prison Garth. Prisoners, patients in secure hospitals, children in secure homes, and those on probation created a mix of visual art, music and writing for the exhibition curated by the artist Bob and Roberta Smith. The exhibition drew attention to artists working outside the conventional art world, and focused on personal experiences of incarceration and mental illness in the North West. Institutions including Ashworth Hospital, HMP Liverpool, and The Spinney Secure Mental Health Unit were represented. Snail Porridge was the result of a collaboration between prison arts charity The Koestler Trust, Castlefield Gallery, and Bob and Roberta Smith, a pseudonym of the artist Patrick Brill. The white cube space of the gallery was transformed for the exhibition. A rickety Victorian door at the entrance led to a steep wooden staircase. Descending into the main gallery, visitors were greeted by bright yellow walls and office shelving holding clay sculptures. A kaleidoscope of colourful artwork crowded the walls, covering any space available. Smith was inspired by a visit to the headquarters of the Koestler Trust, and curated the exhibition to evoke the ‘determination and generosity’ of the charity by partially recreating their offices within the gallery space. 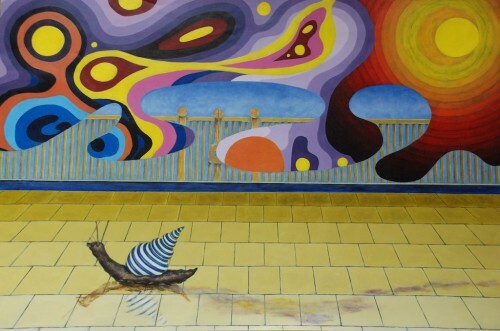 He selected the works in the exhibition from entries to the Koestler Awards, which for fifty years have celebrated artistic achievement within the criminal justice system and secure sectors through annual exhibitions across the UK. Every year, thousands of artworks are sent from prisons and secure establishments to be judged for the awards. Smith is known for his DIY and protest ethos, and for using text and sign writing to advocate the social value of art. His documentary Make Your Own Damn Art argued that art belongs to everyone, and has a vital role to play in democratic society. His 2011 piece Letter to Michael Gove denounced the then education secretary’s proposed eradication of art from the British school syllabus. He created The Art Party, which campaigns for art and design to be given a central place in the school curriculum. In a glowing tribute to the Koestler Trust, Smith created a new work for the show which proclaimed: ‘The Koestler Trust promotes art that provides a future and a direction: develops skills, awards ability and creates conversation… I think the real value of art is the hope it brings’. Themes explored in the exhibition were remembered images of life outside, with many paintings of mountains, trees and beaches. The piece Deal or No Deal was a pencil drawing exploring the journey taken during life in prison, another common theme. Many artists used art as a tool to escape to fantasy worlds, creating experimental patterns, and dream-like pictures of magical landscapes inhabited by dragons, unknown plants, rivers and castles. Snail Porridge is part of the Self-Made strand of curated programmes at Castlefield Gallery, which once a year sees art by non-academically trained artists, or fellow creatives like hackers and writers featured in an exhibition. Visitors looking at the artwork at Castlefield Gallery. The exhibition comes at a time of national debate of the role of the arts in prisons, and the question of whether prisoners ‘deserve’ the privilege of art. Justice Secretary Chris Grayling passed a policy banning books and art materials from being posted into prisons in November. Public opposition to the ban came from poet laureate Carol Ann Duffy and singer activist Billy Brag, supporting the view that the arts have a positive role in rehabilitation. Kwong Lee agreed that art should ask questions about our society and social system. ‘Hopefully our shows create a dialogue,’ he said. A strong element of this exhibition was the programming that accompanied it. Events included a discussion on arts education, and presentations from artists and art therapists who have worked with prisoners. 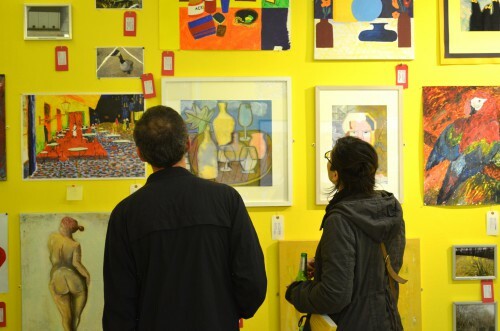 In-depth tours of the gallery drew a diverse audience, including service users from a local homeless charity, families of prisoners, prison workers, and local artist practitioners. This was a comprehensive overview of the practical, ethical, and socio-political issues raised by making art in prisons. Snail Porridge offered a rare glimpse into a world that most audience members have never experienced, or had access to. Artwork by prisoners personalised those who are incarcerated, highlighting their histories, talents and potential. The lasting message was that creativity can flourish in the most adverse circumstances.